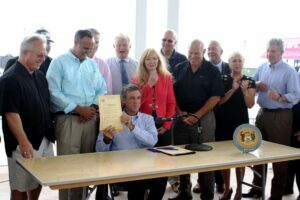 Governor John Carney joined state and local officials, tourism, marine, fishing, and environmental advocates at the Rehoboth Beach Bandstand today to sign two pieces of legislation aimed at protecting Delaware’s coastline and coastal economy from offshore drilling. 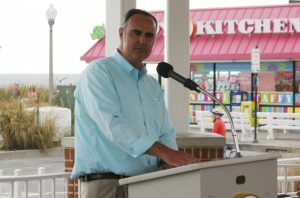 Senate Bill 200 prohibits drilling for oil and natural gas in Delaware’s coastal zone and territorial waters, and precludes DNREC from issuing any permits in connection with the development of offshore drilling infrastructure, whether proposed for Delaware territorial waters or waters outside the state. This legislation will help maintain high-quality coastline waters and protect thousands of jobs supported by Delaware’s coastal tourism industry. Senate Substitute 1 for Senate Bill 207 opposes drilling off Delaware’s coast and directs certain state officials and agencies to enforce Delaware’s rights relating to offshore drilling under federal and state environmental laws. This legislation allows the Delaware Department of Justice to take appropriate legal steps to protect the environment and tourism economy and prevent the sale of oil and gas leases for Delaware’s coastal waters. 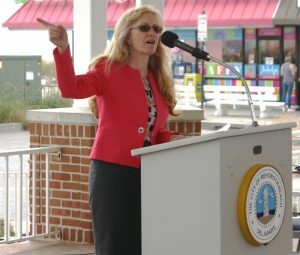 Sen. Stephanie Hansen speaking to the crowd at the Rehoboth Beach Bandstand. Image courtesy WGMD/Alan Henney. Sen. Ernesto Lopez, sponsor of Senate Bill 200. Image courtesy WGMD/Alan Henney.